They have that certain something, are perfectly designed and present water in a completely new way - rain showers offer consumers fascinating and extraordinary showering experiences. Large-sized shower heads are becoming more and more popular and the most recent new models can now also be optimally combined with handshowers. GROHE’s new Rainshower systems are very easy to install. Ideal both for new bathrooms and for retrofitting, they can be installed quickly in every shower - no need to tear open the bathroom wall. An innovative solution permits to bring a perfect rain shower experience to customers’ existing showers. The large-sized modern or retro showerheads are simply installed on the wall using a shower pipe and can be combined with the purist Sena handset. Jan Peter Tewes, GROHE Product Manager, says: “It is a simple solution for easy retrofitting and attractive bathroom design. We offer two different models: The Rainshower System Click which can be connected to an existing fitting and another solution with integrated thermostat for precise temperature control. Both models have the additional advantage that customers can conveniently switch from the headshower to the handshower and vice versa at any time." The new Rainshower systems are characterised by high-quality, solid materials. A separate hot water pipe inside the shower pipe provides protection against scalding (CoolTouch function). The “Rainshower System THM" version comes equipped with an integrated thermostat which controls the water temperature and the amount of water fed to the headshower and handshower by means of an Aquadimmer. Says Jan Peter Tewes: “Rain showers give customers a new dimension of showering. The large-sized headshowers with their 131 nozzles and a diameter of 210 mm envelop the entire body with more water droplets than conventional showers. The high number of nozzles moreover ensures a gentler water spray and the drops do not patter on customers’ skin." A perfect interplay of design and engineering is captured in three pathbreaking product lines from GROHE. Allure, Lineare and Concetto complete the company’s range of Minimalist faucets and fittings. Excellent functionality and exclusive design have been combined to take form and function to a higher level. Many years of product development and a distinguished track record in industrial design have culminated in new faucets which are already set to become not only best-sellers but also modern classics in their own right. “Our Minimalist lines project an innovative yet timeless appearance which will retain its fresh appeal for many years to come. Good looks and excellent technologies have been optimally blended in a formula for long-term enjoyment and immaculate performance," says Paul Flowers, Vice President Design at Grohe AG. Allure, Lineare and Concetto are three different product lines, each with a unique character and based on different design principles. While Allure is characterised by cylinders emerging from square volumes and Lineare thrives on a harmonious blend of rounded and edged shapes, Concetto is designed around the idea of symmetrical axes. These three different approaches have been consistently implemented in each line, resulting in beautifully minimalist faucets and fittings for today’s bathroom styles. GROHE believes in pairing excellent design with outstanding technology, meaning that the look, feel and functionality of a product should always gel into a cohesive concept. Beauty is much more than skin-deep on these new designer fittings which are packed with highly sophisticated and innovative technology. Users will benefit from stylish design and superior functions on a day-to-day basis. Windswept landscapes and years of exposure to the natural elements have inspired CaesarStone’s new Viento texture and colour palette. Australia’s leading provider of engineered stone and quartz technology, CaesarStone offers architects, designers and an alternative to the standard polished surface. Viento embraces a A natural, hand crafted aesthetic andcreates greater design possibilities adding warmth and dimension to modern or classic environments. Viento is created by a special texturing process applied evenly over the surface of the whole slab during the final stages of the manufacturing process. The end product is extremely durable and will never require sealing like typical textured natural stones. Available in popular shades from the existing colour palette, Ivory and Latte, or new shades Ginger, an earthy brown, or Oyster, a classic mid grey – these colour and texture variations will enhance any kitchen or bathroom project. Bathe: Major brands: Kaldewei, Laufen, Hoesch Design,Emco, Multijet. World famous industrial designers are increasingly turning their talents to the bathroom. Local bathware supplier Bathe offers retailers, architects, renovators and homebuilders access to their work by distributing bathware and sanitaryware from design-conscious European manufacturers. Foremost among the award-winning brands Bathe distributes is Kaldewei. The only manufacturer to utilise 3.5mm steel enamel, which is scratchresistant and extremely durable, Kaldewei calls upon the skills of such design luminaries as Sottsass Associati (Milan) and Phoenix Design (Stuttgart/Tokyo). Bathe also distributes Laufen, Europe’s largest sanitaryware producer, boasting collections by Alberto Alessi and avant-garde architectual duo Ludovica and Roberto Palomba. 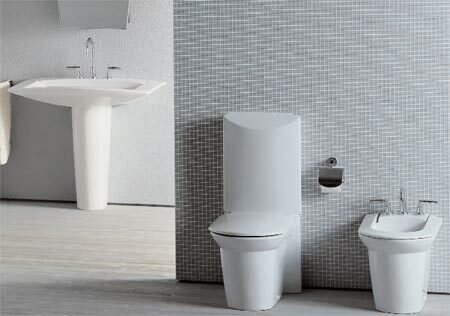 Another of Bathe’s luxury offerings is the Hoesch Design bathware range. Norman Foster, Philippe Starck and Andrée Putman are among the household names who have sculpted Hoesch Design baths using the company’s signature material—a glass-smooth cast acrylic. Emco’s Red Dot award-winning bathroom accessories —from taps and soap dispensers and to towel racks and toilet roll holders—are also available from Bathe. 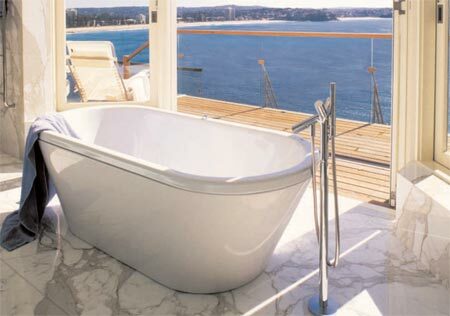 All of Bathe’s products are selected for quality of materials, excellence of design and their ability to make bathing a luxurious and blissful experience.